New Zealand Itinerary, 9 Days 8 Nights (With Cost Break Down) - Always Travelicious ! 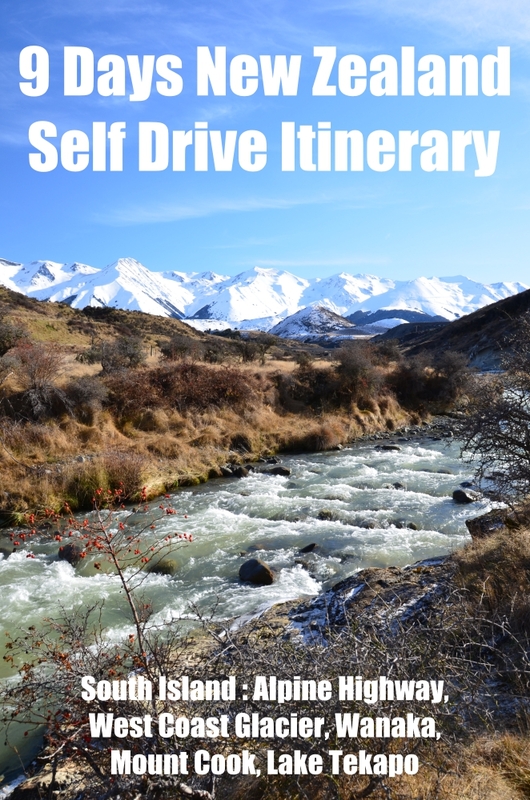 This 9 Days Self-Drive New Zealand itinerary covers attractions, places to eat and accommodation in the glacier regions of West Coast, Wanaka, Mount Cook and Mackenzie. A lot of driving was involved in our fantastic road trip but we didn’t mind one bit because the sceneries were so stunning along the way. Come to think of it, there were only 3 days (day 3, 5 and 7 ) that we did not drive and stayed put in one place. A tip for this road trip would be to pack some lunches along because there are many scenic spots and picnic tables to make pit stops. If you need a cost break down of the trip, it was roughly RM 5578 per person (the cost is updated in 2016, using the exchange rate of NZD2.917 = RM1). Do see the cost breakdown at the end of the post. Day 1 – Arrival in Christchurch. Drive Christchurch –> Greymouth. Drive from Christchurch to Greymouth via Arthur’s Pass Road. Arthur’s Pass is also known as the Great Alpine Highway with magnificent views. We went during the winter and the endless snow-capped mountains on the highway had us mesmerised all the way. The journey from Christchurch to Greymouth would take 3.5 hours if you drive non stop. With so many beautiful places such as Lake Lyndon, Castle Hill, Cave Stream Scenic Reserve and Arthur’s Pass Village to stop by, do plan for a few extra hours for the journey (it took us about 8 hours). If you would like to start the journey with a good breakfast, stop by Flavours Vineyard Cafe in Selwyn that’s enroute. Arrival in Greymouth. Check in Alpine Rose Motel. Dinner at Australasian Restaurant and Bar. Greymouth to Punakaiki was an easy 30 minutes drive. We took a walk along the coast to see the Pancake rocks and blowholes at the Paparoa National Park. The rocks seriously resemble stacks of pancakes ! Plan for more time if you wish to do other activities at Punakaiki such as caving and canoeing. Picnic tables are available so pack your own lunch and enjoy the sea breeze. We drove from Punakaiki to Hokitika after lunch, which took us about an hour plus. 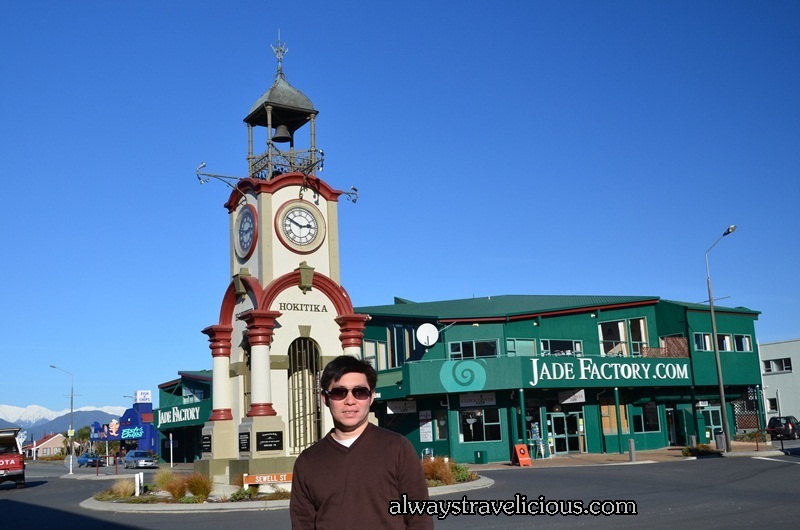 Hokitika is the home of the New Zeland Jade, the green stone, or “pounamou”. It’s a good place to stop by to see the clock tower and also to buy some souvenirs if you wish. The last drive of the day was from Hokitika to Franz Josef, which took 2 hours . Check in Alpine Glacier Motel. We did a full day hike at Franz Josef Glacier and it was the most amazing experience ever ! Two companies offer the guided tour, Franz Josef Glacier Guide & Fox Glacier Guide. I think both would offer more or less the same things but we ended up going to Franz Josef Glacier. If you don’t hike or exercise regularly and you think it could be tiring, opt for the half day tour instead. Day 4- Drive Franz Josef –>Wanaka. On our way from Franz Josef to Wanaka, we stopped by Fox Glacier and Blue Pools. Fox Glacier is about 30 minutes away from Franz Josef township and it’s more accessible than Franz Josef Glacier, meaning that you only have to do a 15 minutes walk to see the glacier (it takes about 40 minutes walk to see the beginning of the Franz Josef Glacier). 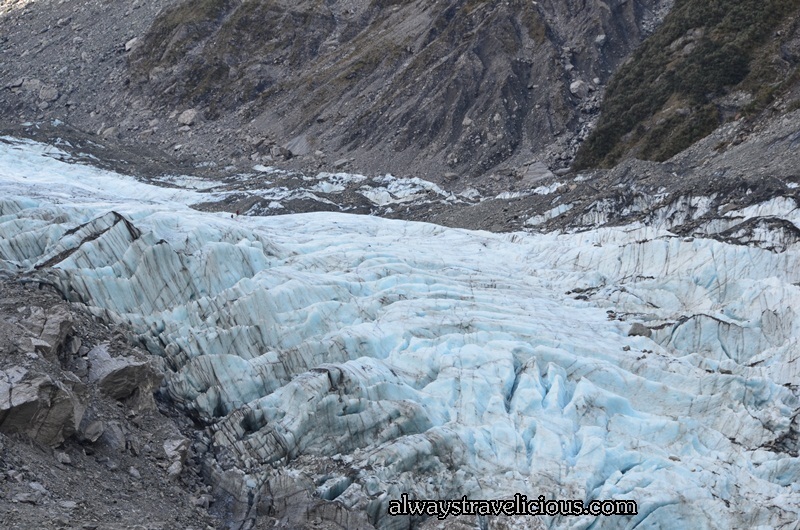 Check out Fox Glacier if you did not get enough glacier beauty on your previous day ! The Blue Pools in Mount Aspiring National Park is located along the Haast Pass. The waters were crystal clear with an emerald hue. We spent about 1.5 hours (to and fro) walking to see the blue pools. You could trek further if you wish. Check in Lake View Motel in Wanaka. The motel was gorgeous with a million dollar view I would highly recommend this motel ! Day 5 – No Driving. Full day at Wanaka. It was an easy day for us at Wanaka. We wanted to do an easy hike at the diamond lake conservation area, but the roads got icy as we walked along so we had to call it off. We them stumbled upon Rippon Vineyard, thinking that it would have a cafe for lunch. Only wine tasting was available but we left the vineyard totally dazzled by its beauty. Do check this Vineyard out if you are into wine tasting ! For the rest of the day, we walked about Wanaka town and also hung out at our motel. 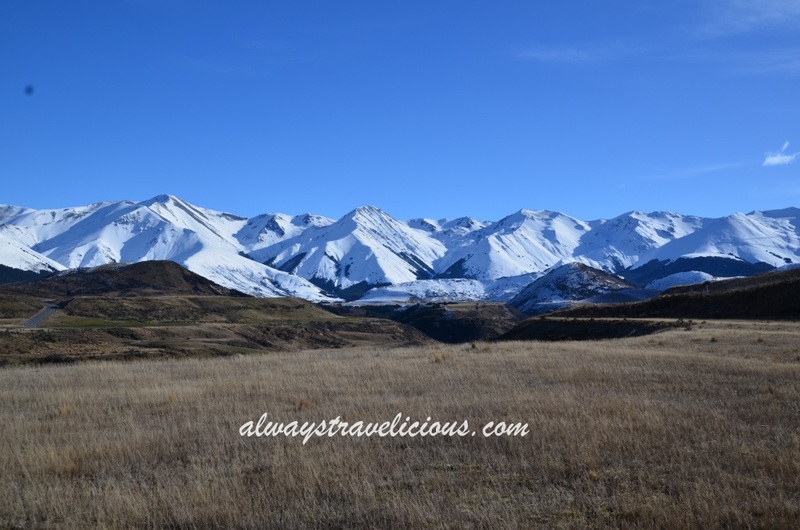 Do note that the next destination, Mount Cook is very secluded with only two restaurants and no convenience stores so if you would like to top up any food supplies, do so at Wanaka. Dinner at Capriccio Bar and Restaurant. 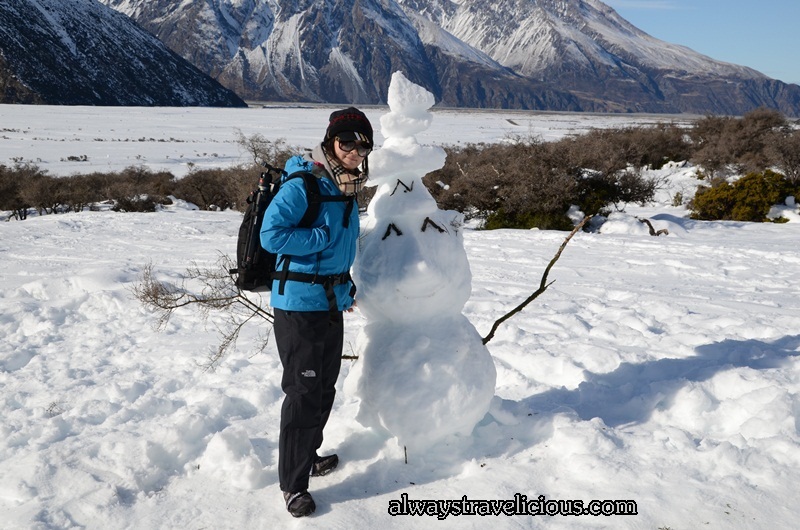 Day 6 – Drive Wanaka –> Mount Cook. The drive from Wanaka to Mount Cook took us about 2.5 hours. Along the way, we stopped by Tarras Village & Peter’s Lookout. 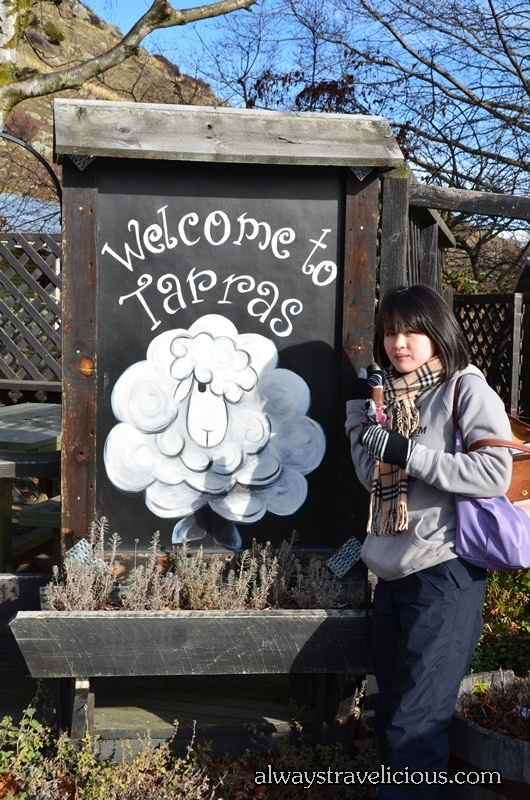 Tarras was a cute little village to top up some snacks. Don’t forget to check out “House of Shrek” at the village. Shrek is the hermit Merino wether from Tarras that avoided his hair from being shorn for six years. When he was found, he looked like a big ball of cotton candy ! 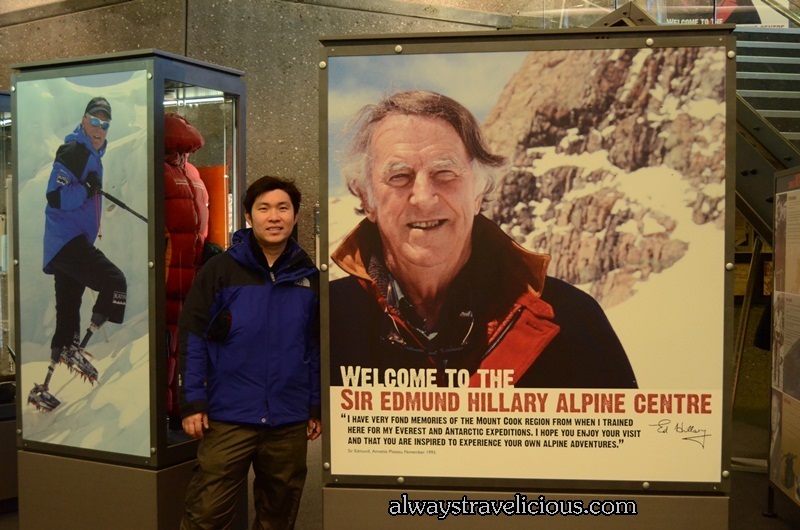 When we arrived Mount Cook, we visited Sir Edmund Hillary Alpine Museum, which is adjoined to the Hermitage Hotel. The museum is a tribute to Sir Edmund Hillary, and also showcases the history of Mount Cook and mountaineering Check in Aoraki Mount Cook Alpine Lodge. Day 7 – No Driving. Full Day at Mount Cook. We spent the day at Mount Cook. We walked the Kea Point Walk to see the Mueller Glacier Lake. The walk was easy on flat terrains and took 2 hours to and fro. Day 8 – Drive Mount Cook –> Lake Tekapo. We stopped by Lake Hawea, Lake Pukaki and Mount Cook Alpine Salmon Farm on the way from Mount Cook to Lake Tekapo. Doesn’t the notion of salmon being reared in the mountains intrigue you ? The salmons are reared in hydroelectric canals where pristine waters run. Salmon sashimi were sold right at the farm but no utensils were provided. You could either bring your own chopsticks to eat the sashimi right there and then, or buy the sashimi and bring it along with you. For lunch, we ate at Kohan Japanese Restaurant, not too far away from the farm. Salmon for sure was what we had at the restaurant ! When we arrived Lake Tekapo, we visited the Church of the Good Shepherd and Mount John Observatory. The Church of the Good Shepherd forms an iconic scene with the turquoise-blue waters of Lake Tekapo at the side,and the southern alps as the backdrop. For Mount John Observatory, we visited twice. Once during the day and once at night. Mount John is easily accessible during the day if you wish to drive up to see the panoramic view of the lakes and the southern Alps. Access is restricted at night. We went again at night for the Mount John Observatory Tour by Earth & Sky. Light pollution is minimal at this region so if you look up the sky at night, you will fall in love with the milky way and millions of stars up there. The tour offers viewing of stars (Saturn, Mars, etc) from the telescope dome. Aoraki Mount Cook Alpine Lodge 2 nights = NZD 160 x 2 = 320 (There are only three hotels in the area, this one, the Hermitage and the YHA. I found the Aoraki Mount Cook is pricey considering that it’s quite basic, I think it might be better to stay at YHA to lower the cost; I had a peek at the YHA, it looked clean & comfortable). About NZD 230 per person, including about 5 meals in restaurants, and other meals we prepped our own food (ingredients bought from super market). Previously when I travelled, I flew Air Asia when there was still a direct flight from KUL to Christchurch. Now the route is no longer available, so the RM2200 is based on the return route of KUL – Auckland by Air Asia, then Auckland to Christ Church by Jet Star. Mackenzie’s Stonegrill, Lake Tekapo, New Zealand. Kohan Japanese Restaurant, Lake Tekapo, New Zealand. Tailor-Made-Backpackers @ Lake Tekapo, New Zealand. sure thing:) look forward to reading more stuff from your blog! Hello Bren. I have been to north island but we didn’t plan it very well so we spent a lot of time driving. We passed by Kaikora and the sunbathing seals there were amazing !! may I know when you go to this beautiful country? Wow…. that was an amazing trip. May I know how much you spend for the whole of this trip? Hi Ivy , I think it was about 12k ? But that was about 3-4 years ago when the exchange rate was lower. When did you visit NZ? Wondering if it’s safe to self drive in Early May to mid May. Hi Hong Xin. I visited in July 2012. We felt safe all the way. The roads are easy to drive, decent road signs and not really not that many cars on the road, considering that New Zealand is a country with more sheep than people! All the towns (on the itinerary) we visited were small towns and people were generally friendly; the towns also pretty much become quiet after 9 pm. Hi, I would like to ask, as I’m a bit confused here. From the breakdown, you mentioned it’s about rm5k plus total per pax but in the comment you mentioned the whole trip was about rm12k plus. 1. Will the same itinerary be ideal for a Dec period? 2. Are there any stops in between that we could do sky diving? 3. For the accommodations, did you book prior to arrival or a walk in would be okay? Hi Sha. Thank you ! 1. Yes. Same itinerary is usable but you’ll just see different sceneries because of different season. 2. Check Lake Tekapo, and Wanaka. 3. I always book my accommodation in advance so I won’t know if it’s ok to walk in. For the car, 35 nzd does it incl insurance. cos usually if you add insurance, cost will be higher. mind to share which company you book from? for the meals, may i know where you make the meal? if in the motel does it include cooking / kitchen ware? Thanks for reading the article ! My husband was the one that booked the car so I am sorry I forgot about some of the details for the car rental. But I know that for NZD 35, it usually comes with some basic form of insurance. If you feel it’s inadequate, you can upgrade it at an additional cost. For the meals, for the ones we ate in restaurants, it’s actually stated in the post as well. The motels also included a small kitchen with basic kitchen ware (pots, pans, utensils) for cooking. You may also see this page for different stages of the journey, and hotel & restaurant information. Hi, Found out that ur trip was awesome:) I backpack there for a year since 2011. Thanks for your advise! Appreciated so much ya! hugs..
no problem. you’ll have an amazing time in new zealand ! Hi. Came across your whole trip and it is amazing. Just a quick check, which month did you travel to NZ? I am planning my honeymoon is May and wish to know if I can use what you have planned as a framework to plan mine. Thanks in advance! Hi Eng Yeow. I went in July. I think it’s no problem to in May following the itinerary. You might want to add in Queenstown if you have time 🙂 Have fun ! Hi BoonSiang. The cost is per person, so each person 6 K + and for total trip it was 12K +. It could be more expensive because the trip was a few years ago . and hotel prices probably went up.